Global Women for Wellbeing, a nonprofit founded two years ago by several women in the wellness and design industry, hosted a half-day hands-on workshop before the conference celebrating women leading in the design field. Participants included a mix of designers, workplace consultants, furniture dealers, and wellness experts hailing from as far as the Dominican Republic to Alaska. Presentations covered a wide range of topics including the current and growing health crisis, the market opportunity for buildings and design, biophilia, environmental psychology, healthy building certification updates, manufacturer labeling and many, many case studies! 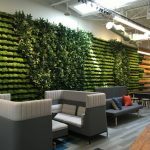 The XPRIZE for Healthy Buildings is a challenge to design teams to “grow a wall.” That’s right, you heard us. Hear from Eric Corey Freed and this amazing competition. Sally Augustin’s new book is Designology: How to Find Your PlaceType and Align Your Life With Design, written for designers AND their clients. Mindful Materials is a one stop shop to classifying the health and environmental impacts of products from leading manufacturers. MaterialsCAN is the Carbon Action Network that drives awareness to better understanding the importance of embodied carbon of specified materials. WELL v2 is out of pilot stage! Time to integrate into your projects. 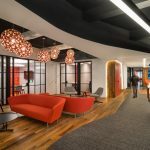 The American Society of Interior Design (ASID) headquarters, the first WELL and LEED Platinum Certified space, has plenty of juicy metrics and stories. Check out their research findings. Consider the neuro-diversity of our workforce and how to best accommodate those with Dyspraxia, Dyslexia, Attention Deficit Hyperactivity Disorder (ADHD), Dyscalculia, Autistic Spectrum, Tourette Syndrome or other unique conditions. Kay Sargent reminded us of the size of this group and some of the ways to make this demographic more comfortable and effective in the workplace. What are pressing questions about design and health your clients have today? When it comes to health and design, what would you would like to know more about to deepen your expertise? What are the biggest barriers to integrating health and wellbeing into your work? In general, the most common questions asked by clients were about specific design strategies to improve health and wellbeing and the cost of adopting these strategies. Participants said they personally wanted to know more about detailed design strategies, research and metrics. How can I measure specific benefits to human condition? How can I get clients to stop obsessing about ROI? How can I better accommodate ADHD, children’s health for K-12 facilities, etc.? Is the well building movement equitable? Could it be more so? What happens when we move or grow after we’ve made healthy investments in our buildings? How do I motivate people to “begin”? What can healthy design do to impact attraction and retention? A special thanks to the corporate sponsors of this event, the many speakers and all of those who attended. It’s a big deal to commit to a conference that is a “first” of any kind. You all are on the leading edge and deserve a big pat on the back for advancing our industry. Onward and upward!